When a band of homeless people cremate a beloved dog in San Francisco's Golden Gate Park, the authorities are willing to overlook a few broken regulations. But three weeks later, when the dog's owner gets the same fiery send-off, the San Francisco Police Department has a real headache on its hands. The autopsy suggests homicide, but Inspector Kate Martinelli and her partner, Al Hawkin, have little else to go on: a homeless victim with no positive ID, a group of witnesses with little love for the cops, and a possible suspect, known only as Brother Erasmus, who proves both articulate and impossible to understand. Erasmus, has a genius for blending with his surroundings, yet he stands out wherever he goes. He is by no means crazy—but he is a Fool. Kate begins the frustrating task of interrogating a man who communicates only through quotations. In Laurie R. King's To Play the Fool, trying to learn something of his history leads Kate along a twisting road to a disbanded cult, long-buried secrets, the thirst for spirituality, and the hunger for bloody vengeance. 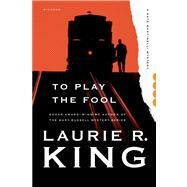 Laurie R. King is the New York Times bestselling author of twelve Mary Russell mysteries, beginning with The Beekeeper’s Apprentice, and five contemporary novels featuring Kate Martinelli, including To Play the Fool, A Grave Talent, and With Child. An Edgar Award winner, she lives in Northern California, and her new novel, The Bones of Paris will be published September 2013.